I'm Running to Eat! 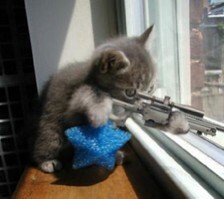 : We have a winner! Today was an unplanned rest day. The weather forecast called for an icy, winter storm for our area so I switched around my schedule so I could get 3 miles in on my regular rest day and I could enjoy Tuesday from the warm comfort of my kitchen! Tonight I'm hitting the indoor track at our local high school, hoping to get 5 miles in while the kid's are at wrestling practice. It's a beautiful day out but the roads are a little too slippery for my feel comfortable out there with all the cars. Since the weather canceled all of yesterday's after school activities, I spent a little time in the kitchen trying out a great recipe that I found over at Kalyn's Kitchen. We're not on the South Beach Diet but with all the delicious recipes that Kalyn comes up with, I'm thinking we should be! Tonight's dish was Swiss Chard and Mushroom Squares, a savory egg casserole with plenty of greens and lots of baby portabella mushrooms. Yum! I had a couple of bunches of Kale on hand so I substituted it for the swiss chard and it worked well. There was a bit of chopping involved but it went quickly as I chopped and added straight to the skillet. While the dish was in the oven I whipped up a few brunch-like items and we had a breakfast-for-dinner night: cinnamon apples, French Toast sticks with maple syrup and some wonderful center cut bacon. 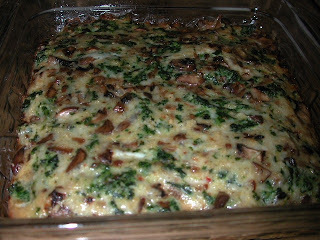 I wasn't surprised that I liked the Swiss Chard and Mushroom Squares. I've loved all the Kalyn's Kitchen recipes that I've tried. I wasn't even surprised that dh liked it. If you serve it with bacon, he'll eat anything! What did surprise me was that 3 out of 4 kids actually ate their portion without much cajoling and actually asked for seconds! (and didn't even try to pick out all the green stuff!) We will definitely be making this one again sometime soon. Preheat oven or toaster oven to 350 F.
Cut away center ribs from chard. Cut chard into thin ribbons, then chop coarsely. Wash chard in salad spinner or colander. Bring small saucepan of water to a boil, add chard, salt, and red pepper flakes. Boil about 10 minutes, until chard is softened and cooked through. Let drain while you prep other ingredients. Heat olive oil in heavy frying pan. Saute onions over medium heat about 3 minutes; add garlic and saute 2 minutes more. Add mushrooms and soy sauce and saute 5-7 minutes, or until mushrooms are softened and liquid is evaporated. Squeeze water from drained chard and place into large plastic bowl. Add mushroom mixture, grated cheese, Panko crumbs, beaten eggs, and Spike Seasoning and mix together. Spray 9 X 9 inch glass or crockery casserole dish with olive oil or non-stick spray. Pour in egg mixture. Bake 20-25 minutes, until firmly set but not hard, and slightly browned. Let cool slightly, then cut into squares. Serve hot or at room temperature. This is good served with sour cream. These sound so good, I have to make these. Very Nice. I like the sound of that.